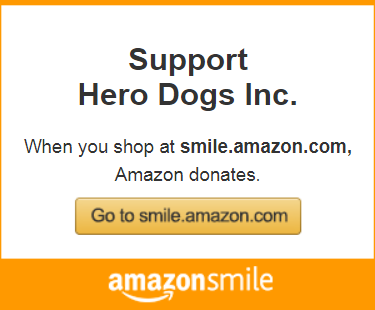 We are grateful for the support of all of the individuals and organizations who raise funds for Hero Dogs. All third-party fundraisers help Hero Dogs by raising awareness of our mission as well as raising funds. Please read the following and contact Hero Dogs before planning your event or fundraiser. Complete our Third-Party Fundraising Agreement, which is a legal document that protects both parties from any misunderstanding or wrong-doing. Send the completed agreement to hero@hero-dogs.org. If your idea is consistent with our mission and values and meets all requirements, our Executive Director will review and approve the agreement. Once the Third-Party Fundraising Agreement has been executed by both you and Hero Dogs, you can begin the planning for your fundraiser. Hero Dogs is a very small organization, so we are unable to provide any administrative or organizational help for your fundraiser. What we can provide is printed materials about Hero Dogs (brochures, capabilities statements, postcards), and thank you letters and tax receipts to donors you identify to us. If your event is open to the public, we’d be happy to put it up on our calendar to help raise awareness of it. Please note that we do NOT ask the Veterans with Hero Dogs to attend events — we feel that they’ve already given enough. However, if you are local and if it is appropriate, we can do our best to provide a Hero Dogs volunteer or staff member to attend your event with a service dog in training. Please note that we do not always have the personnel available to support events with our attendance. If you would like further information, please send an email to hero@hero-dogs.org. Thank you so much for your interest, and we look forward to working with you! Your gift, pooled with other support, will help us provide service dogs and other highly skilled canines to America’s heroes. Funds donated to a specific dog may be utilized to support general program needs. Hero Dogs, Inc. is recognized as a tax exempt organization under section 501(c)(3) of the Internal Revenue Code. Contributions to Hero Dogs are deductible under section 170 of the Code. A copy of our current financial statement is available on request by contacting Hero Dogs, Inc. at P.O. Box 64, Brookeville, MD 20833-0064. Documents and information submitted to the State of Maryland under the Maryland Charitable Solicitations Act are available from the Office of the Secretary of State for the cost of copying and postage.